One of the reasons I chose the Episcopal Urban Intern Program - even when we lost our AmeriCorps funding and I may or may not be getting any sort of stipend towards my college loans at the end of the year - was that we are so focused on personal development and community building within our group throughout the year. Not only am I given housing with others who are choosing to live in intentional community with me, but I'm also taken on amazing retreats, at least three throughout the year, for reflection, vacation and downtime. So finally, after two official months of living here (well today marks that anniversary. I can't believe it, honestly!) I finally got out of Los Angeles to see more of Southern California, namely the 101 highway up to Santa Barbara. That means lots of brown desert mountains and the ocean. We stayed at a retreat center in the mountains almost out of the city. It was within a monastery, which was absolutely perfect. The downtime, reflection and spiritual focus was something I really needed right now, something I've been working on doing a lot of these last few months in general, but getting the space and quiet time to really do it was incredible. I really did some true realignment and focusing in on myself, my needs and my goals for this point in my life. Where I've put myself now: centering on keeping balance between being very present to the journey I'm on right now and the life I'm living here, while also focusing on my larger life goals and the things I want to do next year and beyond. Looking at the ways and options I have moving forth, while staying focused on what is happening today. Here's a view from the back porch. 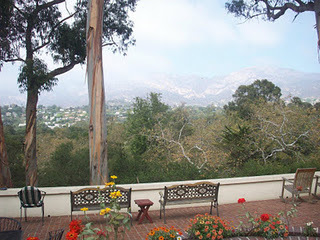 You can just barely see the mountains beyond the houses in the hills the deck looks upon. 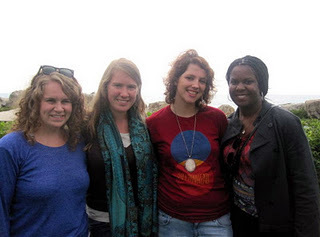 This is Allison, me, Casey and Valerie at the end of the retreat. The retreat was good in so many ways. The weather cooled way down, so I felt like fall was coming in around me (I miss it!! I really do!) I didn't bring my wool socks, but I had a sweatshirt and scarf and got to read and drink tea for a few hours which was amazing. I got a lot of work done on the book. Also, they had a small labyrinth at the monastery. I have not gotten to walk one since I was at Grace Cathedral in San Francisco with Lauren in December of 2008 and I have loved that experience each time I've been able to do it. I also got to spend more quality time with the great interns that are in my program. We go out on the weekends quite a bit, but I function so well one-on-one and after I've developed a relationship with someone so it was good to have the chance to keep doing this. All in all, I really felt good there, quieting down and focusing inwards. Made me think a lot about what I need to do right now with my life this year and what I could be doing next year. Once again, I'm focusing on letting go and being opened to whatever is supposed to come next. The rest is rumblings stewing in the back of my mind. I'll keep everyone posted if they begin to form something more tangible. We came back in LA right as the Friday afternoon traffic was picking up. It took us an hour and a half longer to get home than it took to get to Santa Barbara. I had a very relaxing weekend at home, staying in on Friday, doing yoga and going to a showing of the cult zombie and alien movie Plan 9 From Outer Space with a special appearance by one of the actors on Saturday night. It was the worst movie ever made. No question. Please watch it if you ever can, especially on a big screen. It is very much worth your time. Today its back to work, but I'm very rejuvenated and ready to face the holiday season and all that will be coming with that. Your program sounds so cool. How wonderful to be part of a community. I want to do this program too!